The superheroes of tiny spaces. Save The Children is one of the best known NGOs in the world, able to work under great stress and demanding situations. 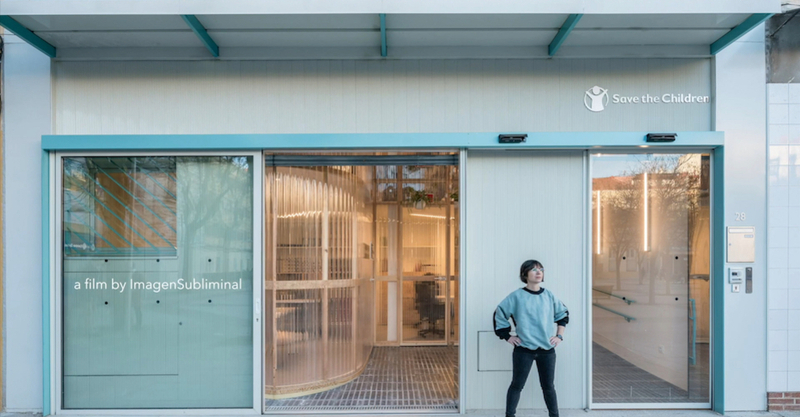 When they decided to expand their presence in the San Diego neighbourhood in Madrid, for the social work that this NGO carries out in the Vallecas area, they chose to work with Elii, a Spanish architectural studio, who is famous for its creative transformations of tiny spaces. Their proposal is based on adding a new body that is suspended over the existing structure. This extends the building and configures a new façade, as well as a new communication and service core. The project addresses the needs of a child care centre. Many of you may remember their 097 · Yojigen Poketto project (which made the shortlist for the 2018 Simon Architecture Prize), where the architects were challenged with similar strict conditions in terms of space. Despite its narrowness, the space designed by Elii offered a lot of possibilities as it is designed as a playground to be used in a variety of ways with the active participation of its inhabitants. The Save the Children's headquarters follow the same process: the space is particularly flexible and it can adapt to a wide range of situations, from meetings, to lectures and workshops. It allows for privacy thanks to the foldable walls and it is provided with mechanisms that favour a collaborative arrangement of spaces. Studying some modern child care methodologies, Elii have found out the great relevance of practices that encourage self-confidence, responsibility and affection for others, such as the care of pets or plants, so they filled the space with elements that encourage care, such as plants (in the pots) and some so-called 'architectural pets' (integrated within the various spaces) that will be cared for collectively. Using their signature playful tone, Imagen Subliminal has created a video for the project. We are guided inside the structure by one of the workers, from the entrace and the stairs - here we can really appreciate the color palette chosen for this project - all through the main squared space of the Save the Children headquarters. Using the stopmotion technique, two people arrange the space in all its possible variations, turning this operation is a kind of a game for both children and adults.